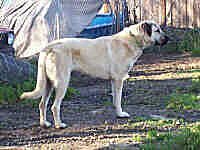 We began our Anatolian Shepherd Dog breeding program based on our original female line. We do not breed frequently as careful evaluation of each generation we have produced is a must. This ensures that balanced and correct temperament remains in the line as has been established via the native shepherds' villages and their manner of raising working dogs in Turkey. Family homes are important for testing this. Raising dogs as untouched or isolated LGDs without a focus on their shepherd and family related heritage will, over time, select or create unwanted changes in the breed temperament - there are unfortunately some bloodlines with much sharper, less bold temperaments. Working homes ensure that we maintain correct character and continue to teach and learn more about the behavior of the breed. We require OFA certification of hips for all intended for breeding purposes. This is so we can do as much as possible to ensure that we are are not taking off on a tangent with a bad breeding nick, a situation that has befallen many bloodlines in many breeds. This certification requirement has recently been extended to all pet and working dogs that we place with rare exception. EVERY pup is part of the family and provides potential genetic information that can help in decision making in the bloodline. Our goal has been to work with the genetic type with which we started and to preserve this breed type which we have come to love. We select for soundness, long fuses, bold temperament with steady tolerance, we strive for longevity and native working ability. We aim to do this without creating a "new look" to this magnificent breed and to remain faithful the breed type with which we began. We do not breed without serious study of what each breeding has the potential to produce. Sabah, who started it all for us. She was born 1988. Bertha in foreground. Zor sits. Bertha is a Sabah daughter, born 1991. Zor is about 1.5 years in the photo. She is a Bertha daughter, born 1998. Ruya at one year in 2004. She is a Zor daughter.